Hello all, does anyone know why there are 2-3 black unmarked police cars sitting on St. Marks between Carlton and Vanderbilt Ave 24/7? Seems like they're planning on continuing for another month or so. Every time I walk past, I can't help but feel more curious. Anyone know anything? or have the guts to ask them? I think one of Obama's cabinet members (Lynch) is staying in a building there - these are her security appointments. That would make sense. I'd imagine that she'd live in Brooklyn (or somewhere close) given that she was the top federal prosecutor for Brooklyn/Queens/Staten Island/Nassau/Suffolk before taking up her current position. Neighbors in her Brooklyn neighborhood, while unaware of Lynch’s law enforcement exploits, were thrilled by word of her likely ascension. Wow, that's crazy she's staying in the neighborhood. 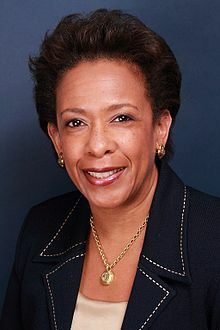 She must be settling in to continue the FIFA bribery case that is going through Brooklyn Federal Court. I imagine that if you prosecute organized crime or terrorism, you get a security detail for the rest of your life. Not sure if you can accept a free beer. Granted, I doubt she's home now (she's probably staying somewhere in Washington for the time being before moving down there for the remainder of her tenure) as I'd imagine the security presence would be even greater if she was. I know she gave an update on the FIFA investigation in person in Brooklyn last week. Maybe she's working part time from Brooklyn and part from DC? she's been living there. only after she got appointed did the vans show up. the fifa thing was after the suv's showed up. She has lived in Brooklyn most of her life and that is her current resident. I have seen her before in Hooti Couture, Key Food and the shoemaker near Ideya Restaurant. Did Loretta ever move back to Brooklyn?